To attract its users, Orkut borrows the "Like" button from Facebook. 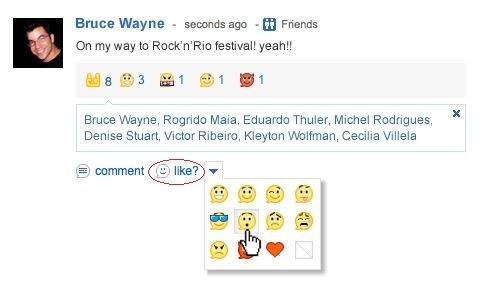 Earlier this week, Orkut in its blog proudly announced the arrival of the “Like” feature. Hearing the word “Like” reminds us, the Facebook’s Like feature, where you can like a story or an update by a friend. Here, we have a twist in the tale. Orkut on the other hand has made the like feature a bit complicated and pretty useless in order to show that they are smart and different from the Facebook. For instance, in Facebook if you want to like someone’s story or an update, then you can just go ahead and click on the “Like” button and it will show that, you have liked the story or an update. But, here in Orkut if you want to like someone’s story or an update, you will have to choose an emotions along with the “Like” button. I found this feature quite useless since liking someone’s status update with a crying or a sad emoticons sounds a bit illogical. Orkut has already promised to bring many changes in the near future, but if this continues, Orkut might be shut down soon in countries like India and Brazil, where it was the No.1 social networking site, a few years ago. Do follow us for more updates.